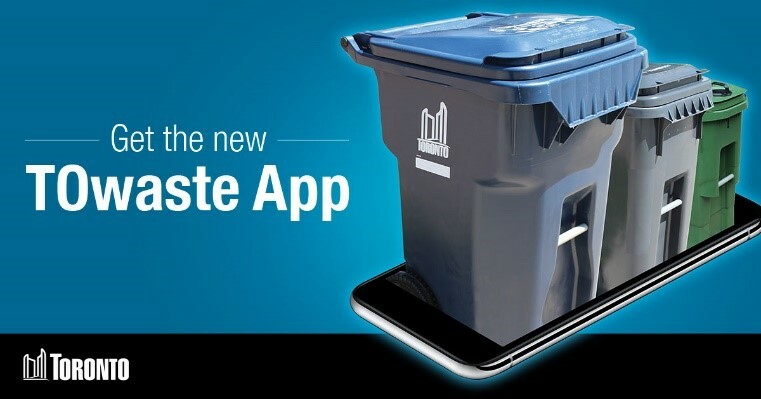 To further our goal of becoming a city with a circular economy, the City of Toronto's Solid Waste Management Services (SWMS) Division is teaming up with Enbridge Gas Distribution Inc. to begin creating renewable gas from Green Bin waste. As part of this initiative, new equipment will be installed at the Dufferin Solid Waste Management Facility later this year that will allow raw biogas – produced from Toronto's Green Bin Organics – to be made into renewable natural gas (RNG). This process uses a "closed-loop" approach, since the RNG will ultimately be used to power 132, or 90%, of the City's heavy duty collection vehicles! The state-of-the-art Dufferin Solid Waste Management Facility is one of the only two locations in the City where organic material is broken down by using innovative pre-processing and anaerobic digestion technology. The biogas upgrading taking place at this facility is a cutting edge initiative that will play a major role in helping achieve the City's goal of reducing greenhouse gas emissions and our carbon footprint. As Chair of the Public Works and Infrastructure Committee, I have worked hard over the course of this term to create and implement strategies that reduce waste and benefit the environment. RNG is proven as a way to make the natural gas system even greener. Collaborating with SWMS and Enbridge on the RNP project is a big step forward for the City's Long Term Waste Management Strategy and for future renewable gas projects. The Great Lakes and St. Lawrence Cities Initiative (GLSLCI) is a binational coalition of 131 American and Canadian mayors working with a wide array of stakeholders to protect and restore the Great Lakes and St. Lawrence River. I am honoured to serve as the Mayor's designate to the GLSLCI. Their notable initiatives include efforts to mitigate the impacts of climate change and greenhouse gas emissions, incorporate innovative technology in conservation strategies, and manage invasive species such as zebra mussels and Asian carp. Their work is critical, as the Great Lakes and St. Lawrence River contain over 21% of the world's freshwater supply and provide drinking water for over 40 million people. At the GLSLCI 2018 Conference in June, I represented the City of Toronto in discussions on extreme weather events, flooding, coastal resilience, and green infrastructure. As Chair of the Public Works and Infrastructure Committee, I'm committed to supporting initiatives undertaken by the GLSLCI to advance the protection of our shared freshwater resources. At Committee, I recently moved to accelerate the rehabilitation of the Don River and Central Waterfront, a first step towards delisting Toronto as a polluted "Area of Concern" in the Great Lakes. You can read more about my efforts to clean up the Don River, here. For more information about initiatives related to climate change, invasive species, and microplastics, check out the GLSLCI website, here. As the Mayor's designate to the Great Lakes and St. Lawrence Cities Initiative (GLSLCI), I met with municipal leaders from across North America at the Annual Conference in June, including (from left to right) Mayor Paul Dyster of Niagara Falls, NY, Mayor Bonnie Crombie of Mississauga, and GLSLCI President John Dickert, former Mayor of Racine, WI. In response to the recent heat wave, Toronto Water is reminding residents that there are steps they can take to conserve water and reduce their utility bill during summer, the season of highest water use. Toronto Water customers can use the City of Toronto's online water use tool, MyWaterToronto, to better understand their water use and to learn about strategies to save water and money. MyWaterToronto can even be used to check for leaks, which tend to add up very quickly when water usage is high. According to Carlo Casale, Manager of Customer Care at Toronto Water, even a small 1.5-millimetre hole in a pipe can add more than $13 to your utility bill each day. Customers who receive a utility bill can access the tool by visiting http://www.toronto.ca/mywatertoronto and entering their utility account information. The tool can be used to track water use by day, week, month or year. Using rainwater to water your grass and gardens. Planting native plants and trees, which are low maintenance and naturally drought-tolerant. Sweeping sidewalks and driveways clean instead of using a running hose. Using a rain gauge to keep track of rainfall – healthy lawns only need 2.5 centimetres of water once a week. If you have an irrigation system, set your system to come on once or twice a week, or install rain sensors. Watering lawns in the morning to reduce evaporation. Laying mulch can also help retain moisture and insulate roots from heat stress. Setting your lawn mower to cut 6 to 7.5 centimetres - mowing high helps to strengthen the roots and retain water and nutrients. Keeping a jug of water in the fridge instead of running the tap to draw cold drinking water. For more water conservation tips, visit http://www.toronto.ca/water. My Environment Day on May 5th - Save the Date! My Environment Day will be held on Saturday, May 5 at York Mills Collegiate and is a great opportunity to clear out items found during your spring cleaning, such as used electronics and household hazardous waste. You can bring everything from old computer equipment to compact and fluorescent light bulbs for disposal and recycling. You can also bring items for donation such as sporting goods, books and gently-used dishes. "Slow Down" signs are an effective way to remind drivers to respect the speed limit - especially on local and residential streets. 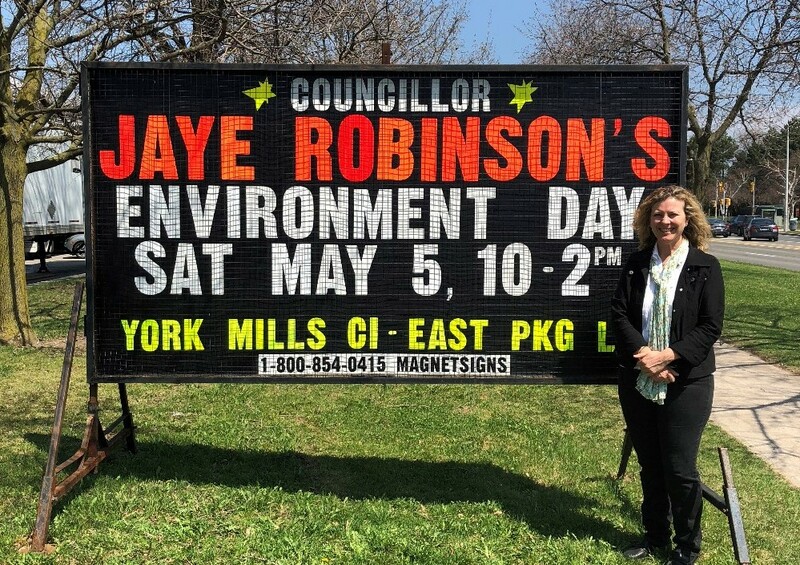 If you're interested in getting a sign for your lawn, you can pick one up at my Environment Day on Saturday, May 5th at York Mills Collegiate! Quantity is limited - one sign per household will be given out on a first come, first serve basis. In December, I was honoured to welcome mayors and municipal leaders from across Canada and the U.S. to Toronto for the mid-year meeting of the Great Lakes and St. Lawrence Cities Initiative (GLSCI). The GLSCI is a binational coalition of 131 mayors from Ontario, Quebec, and the eight American Great Lakes states who advocate for the protection and restoration of the Great Lakes and St. Lawrence River. The Great Lakes are a critical and irreplaceable resource, and I was inspired by the GLSCI's commitment to their continued protection. The Great Lakes and St. Lawrence River contain approximately 20% of the world's freshwater supply and provide drinking water for over 40 million people. The impacts of the Lakes are so broad that it is necessary to collaborate across national and regional boundaries to ensure their protection. The GLSCI's notable initiatives include efforts to ban the production and distribution of products containing microbeads, mitigate the impacts of climate change and greenhouse gas emissions, incorporate innovative technology in conservation strategies, and manage invasive species such as zebra mussels and Asian carp. In Toronto, we are undertaking various initiatives of our own to protect the Great Lakes water system. For example, a 25-year, multibillion dollar infrastructure project is currently underway to reduce combined sewer overflow (CSO) in the Don River as a part of the City's Wet Weather Flow Master Plan. Most combined sewers were constructed as long as a century ago, and utilize one pipe to carry both sewage and stormwater. Usually this combined water is diverted to wastewater treatment plants, however, during periods of intense rainfall, the volume of water may exceed the system's capacity. In this circumstance, untreated sewage and garbage water will be deposited, untreated, into creeks, rivers, and Lake Ontario. This process can pollute our freshwater lakes with bacteria, pathogens, heavy metals, oils, pesticides, and nutrients which can cause undesired algae growth. The City is currently in Stage One of a five-stage program that aims to virtually eliminate CSO. This project serves as an example of how activities under the purview of individual municipalities can have a massive impact on a shared resource, the Great Lakes. I am committed to advancing Toronto's legacy of leadership in freshwater conservation initiatives. In order to do so, we must continue to collaborate with municipalities across the continent through avenues such as the GLSCI. Stewardship of this invaluable freshwater resource is our collective responsibility. As Chair of Public Works, I was honoured to welcome mayors & local leaders from across the continent to discuss the protection and restoration of the Great Lakes. Protect your pipes from freezing. Know where to find your main water shut-off valve (in case your pipes burst). Insulate pipes most prone to freezing, especially near outside walls and in crawl spaces, the attic and garage. Seal air leaks in areas where pipes are located. Check around windows and doors, electrical wiring, dryer vents and pipes. Drain and shut the outdoor water supply as outdoor faucets are the first to freeze. Keep areas that contain indoor pipes above 8°C, especially near the water meter. In extreme cold weather, you can choose to run a pencil thin stream of water to keep water moving. However, you will be charged for the water used if you choose this step. For more information, visit toronto.ca/frozenpipes.